This weekend was my daughter's birthday. We had cupcakes from the best cupcake baker in the United States (which just happens to be up the street from our house), Cupcake Royale. 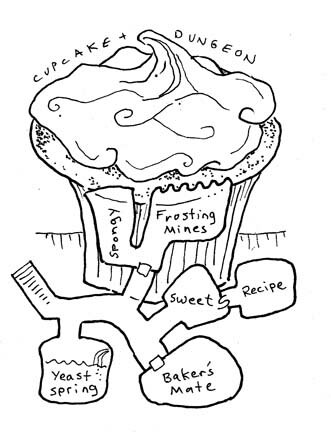 I drew this cupcake dungeon there a few weeks ago. There's this idea for a cooking-themed campaign that I've always wanted to do. The idea goes that any craft, taken to a high enough level, becomes essentially magic. In the Great City State of this campaign world, high-class chefs compete for wealth and acclaim. The PCs are employed by one of these chefs, a job that sends them across the world seeking rare recipes and ingredients, on missions to investigate the plans of rival chefs, and occasionally to fix a magical recipe gone horribly wrong. Great campaign idea, though it would make an even better cartoon! Yeah, it could make a hilarious cartoon! 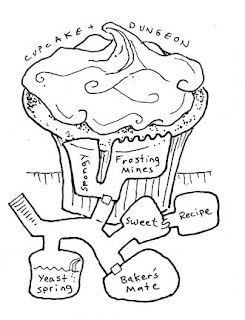 I've always been slightly unimpressed with Cupcake Royale. Not that I won't eat them, mind you--but when I'm dropping serious cash on a high end cupcake, I want my socks knocked off. So far, my footwear has remained firmly in place.